Just as many environmentalists and media outlets place the blame of climate change on beef cattle production, one organization is praising cattle ranchers for their preservation of grasslands. Kevin Ellison, World Wildlife Fund grassland ecologist for the Northern Great Plains, recently spoke at the 2018 South Dakota Cattlemen's Association's Annual Convention and Trade Show, where he acknowledged the value of cattle grazing for maintaining critical wildlife habitats. "There are 25 species of obligate grassland birds — birds that need grasslands for nesting and breeding — across the Northern Great Plains," Ellison said. "Across that group of species, the average has been in great decline since the 1960s. The main threat appears to be cultivation and conversion of habitat." The Breeding Bird Survey was initiated in the 1960s by Chan Robbins and is still used today to estimate the population of grassland birds. Currently, the World Wildlife Fund is conducting bird surveys on ranches to learn more about how private ranch lands provide valuable habitat for grassland birds. "When working with grassland birds, you quickly see that it's the extent of habitat that matters," Ellison said. "These birds need to have access to large intact grasslands, so if we want to have conservation impact at scale, we have to work with landowners. The majority of landowners on the Great Plains are cattle ranchers. 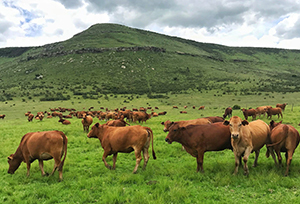 We want to create a viable win-win situation where the grass is used to produce beef and an income for producers and, at the same time, provides a habitat for wildlife as well." The World Wildlife Fund's Northern Great Plains Program works with ranchers across the region to maintain healthy grasslands, viable wildlife populations and economic and cultural resiliency for ranchers as a means to prevent the conversation of ranching lands to cropland, energy development, urbanization and other uses, Ellison explained. That's why they created the Sustainable Ranching Initiative to help sustain ranching families and to bring awareness to the conservation value of ranching lands. To help ensure that grassland remain intact in the long-term, the World Wildlife Fund lends its support to sponsor events such as the South Dakota Grassland Coalition's grazing schools, Ranching for Profit workshops, Leopold Conservation Award Program, South Dakota Cattlemen's Association Happy Cow Tour, South Dakota Grassland Coalition Ranch Bird Tour and ongoing participation and cooperation with South Dakota Cattlemen's Association on the U.S. Roundtable for Sustainable Beef. 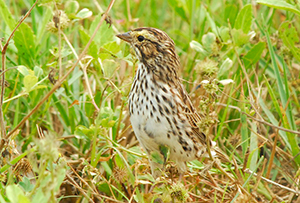 Through voluntary and confidential bird surveys, which take place in May and June, Ellison and his crew look at the number of grassland bird species in the Great Plains. "We engage with private landowners to provide them with custom data of their land while compiling a list of species and number of birds in the pastures," he said. "These surveys provide valuable information to producers and accelerate peer-to-peer learning on management." Since 2015, the World Wildlife Fund has conducted bird surveys on 26 different ranches across Montana, Nebraska and South Dakota, and the organization is looking to double that number in 2019. "We are trying to get 200 producers surveyed in this three-state program by the end of 2019," Ellison said. "We are looking for a variety of species including grouse, hawks, owls, shorebirds, songbirds, sparrow, burrowing owl, golden eagle and western meadowlark, to name a few. Ellison praised the management practices of the ranchers surveyed and says the organization strives to connect producers with beneficial conservation opportunities that help both the landowners and the bird species. "It's so important to us to keep ranchers on the land at scale to have enough grass to maintain this community of bird species," said Ellison. "Grasslands need to be grazed, or they will be turned into something else."